Hello! Bertie here. We’re blogging from A to Z once a week, through to September. Mummy says it’ll take us that long, but we need to spend more time eating grass outside, and not stuck in front of the computer. I have a blogging friend who’s a degu. It’s a small furry animal (like me) but not like me, as he has a long tail and he climbs very well, and he’s quite a lot different in other ways too. Say hello to Joshua the Degu! He’s a handsome chap, isn’t he? Joshua interviewed me and Roscoe on his mum’s blog. My mum says we can interview him later in the year. Maybe I for Interview. But this is what I’ve found out about Degus. they are even more sociable than guinea pigs! they are supposed to typically weigh 300 gms. That’s tiny compared with me. I weigh 1500 gms. I haven’t asked Joshua how much he weighs. Well, that sounds a lot like Joshua to me! This weekend was one year since Midge died. That was a horrible evening. Mummy went out to her bird meeting, and while she was away, Midge went all funny. He lived with Percy in the run next to me, where Neville and Roscoe live now. He started twitching and shaking, then he rolled over on his side and kept twitching. It was horrible, because Percy and I could do nothing. Then Mummy came home and said hello to us, saw Midge, picked him up and cuddled him tight, and phoned the vet. Then she took him downstairs and stayed up all night with him, but he died in the morning. We were very sad, but she let us sit with his body and say goodbye to him. Actually, I found it very scary and didn’t really want to sit with him, but Percy told me to say goodbye or I’d regret it when I was older, and understood better. I think he was right. I made sure I said goodbye to Percy when he went a month or so later. I don’t like it when someone dies, but Percy said it’s natural, and everyone dies sometimes. And then we go over the Rainbow Bridge to the place where everybody’s well and happy, and we can be with our friends again. And Joshua says he understands because all his degu family have died, too. That’s very sad. But he has other friends to keep him company. So that’s our post for D and next week we’ll do E which might be for exercise. I think Eating would be better. It seems a very long time, but it’s a whole year since Dylan pined away for his brother, Dougall, and went over the bridge on February 26th. Mummy missed him a huge amount to start with, and for a very long time after, although of course we cuddled her and helped her through it. She says she’s better now, although she still aches when she sees the videos she took of him. I thought he was an interesting person. He seemed quite bossy, but he was very nice with it. Some pigs can be bossy and aggressive, but he just wanted everyone to do what he thought was best, and if you did that, all was fine. Mummy says he got a bit boisterous during his last birthday party, and she picked him up to keep him from spoiling things, and Kevin and Dougall and I ran around together just fine. He sat on her lap looking down on us, and he was quite calm. Maybe surveying us from a high point, watching over us, just suited him. Kevin says life has been very quiet without him around. I can imagine that’s true. Never a dull moment with Dylan. What a character! I was only a youngster then – and Oscar, Midge and Percy weren’t born at all. It’s a long time ago. I heard about them on the pigvine, what we called the network of tunnels connecting all the important guinea pig homes, like Hugs Towers and the Chateau of Dimerie, and here. Well, I heard about them from Colman who heard about them on the pigvine. He missed his brother George too much to stay any longer. Apparently they are buried together in the garden, but Mummy’s never told me where. I think I can guess though. 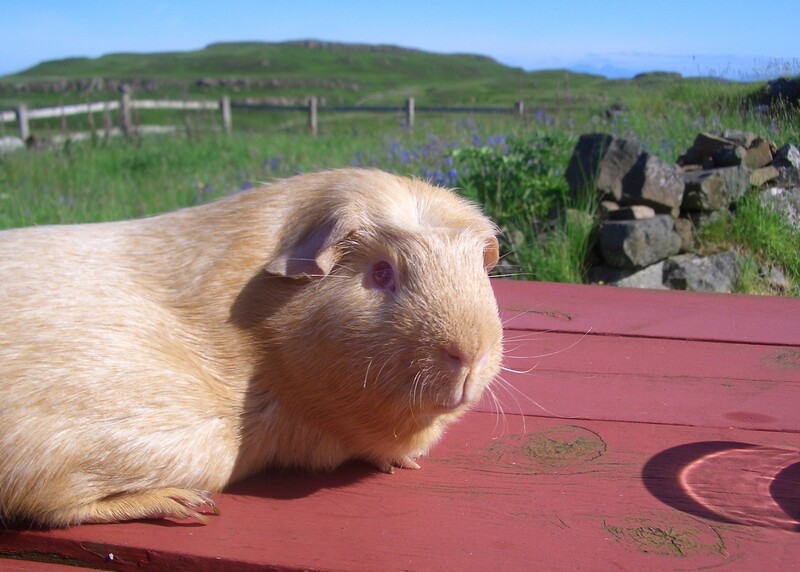 Here he is on holiday in Mull a year or two before he left us. He’d be about three years old here. He was very handsome. Mummy says I remind her of him sometimes – I’ve learnt his Look. Yeah, I have, Mummy!